Aside from the month just finished, 2015 was a not a bad year. More miles, faster, and yet lower heart rate. Of course, I could still want for more. A2A was the best since 2008 but well short of being good. Duluth was quite respectable but did not threaten my 2008 finish in the least. I'm not even going to guess what 2016 will be like. Too many variables and a less stellar skating year is a price I am willing to pay to fix other things. Holy Moly ese002! Those numbers are amazing! And me seeing them is good motivation, esp being 1/1/16. I plan to start tracking all my skating miles plus my running with runkeeper. Though I'll never hit half of that 5700 miles you logged, it'll still be good to see progress and results. Can I get a bite of your mama's chili? Nice job ese!!!! 572 hours is brutal!!! Congrats man, I'm pretty sure that wins 2015 here. I don't really track my miles, as they are all on a ramp, or in a bowl, but I do track my hours. I am very happy with my 515 hours. Despite all the turmoil, the mileage differed by barely 1%. A little slower. No morning commute after January. The implied time pressure always makes for faster skates. Also fewer races but for all the attention given to them, races miles are always dwarfed by training and even recreational miles. To hell with the data, what's not shown is the fact I learned to grind this past year. That in and of itself totally overshadows this chart. 533 hours in the boots beats my total from last year handily! ... I learned to grind this past year...533 hours in the boots beats my total from last year handily! So December was mostly a washout. Somehow the last two days out of three were good skating weather. The Google distance from Portland, Maine to Portland, Oregon listed at 3186.0 from one city center to the other city center. But from the closest municipal BORDER of each city - only 3170 miles. This made it possible for me to get 38 miles in two days and still say I skated Portland to Portland. So I got that number plus 9 more. When I got home and uploaded to Strava, their interpretation of my 2017 miles is 3186.0. That is 3186-point-ZERO! Precisely the miles I needed to both city centers according to Google Maps! Here is the monthly/daily breakdown for 2017. I'm very happy with it. For a nicer graphic and map of my "virtual" cross-country skate, go to THIS post. Last edited by Joey; January 4th, 2018 at 06:45 PM. 2017 was complicated and busy. I started the year unemployed and struggling to find dry roads to skate while enduring the wettest winter in 20 years. I ended the year fully employed and skating 11 miles to work each way adding up the miles (and time) in a major way. In between, I botched the start of Barbary Coast and skipped Rollin’ on the River to see the total eclipse of the Sun. I got rained on for the second consecutive Northshore Inline Marathon. I might have placed if not for Garmin troubles and letting them distract me from the race going on around me. I took a pass on A2A on account of skills issues and ended up missing out a hurricane. I’m kind of glad. Saguaro Sunrise was fun but very rough. Altogether, racing in 2017 was memorable but not particularly inspiring. Finding good virtual travel mapping for the year past was tricky. Skate miles came in 5231. 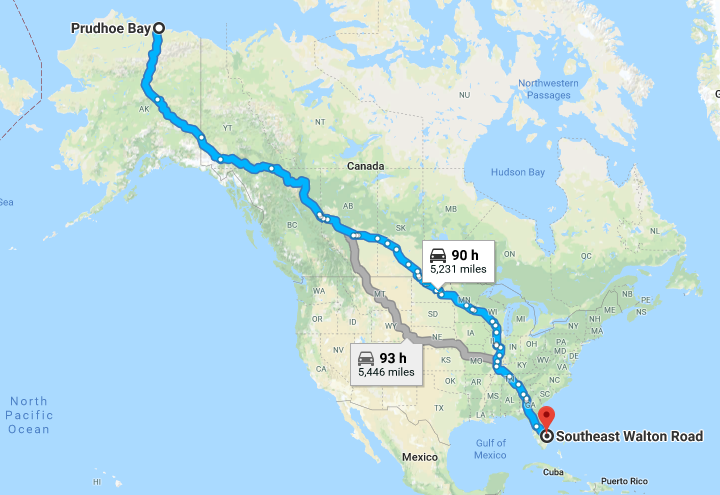 That’s more than Anchorage to Key West but not quite Prudhoe Bay to Key West. I settled on Prudhoe Bay to Jensen Beach. It is still coast to coast. Arctic Ocean to Atlantic. If skate miles bent the coast to coast meme, total miles just plain broke it. 6,063.84 miles exceeds any optimal driving route with end points in the USA by a good margin. 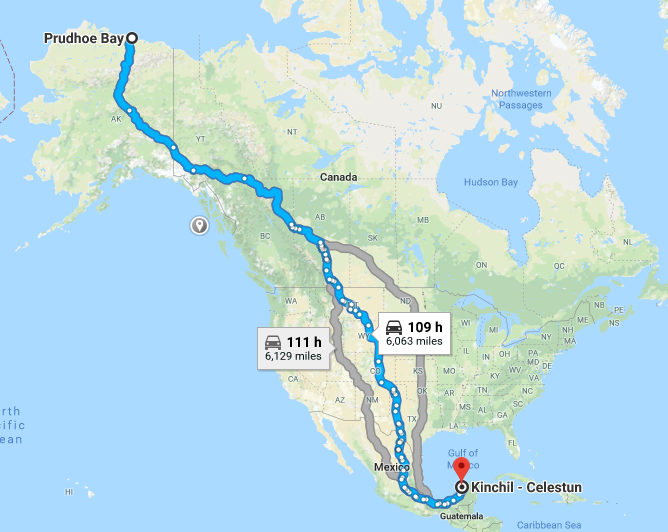 But it’s still kind of cool to have virtually skated, biked and hiked from Prudhoe Bay, Alaska to Kinchil – Celestun, a little Mexican town on the Yucatán Peninsula facing the South side of Gulf of Mexico. A little obscure but it still tundra to tropics. 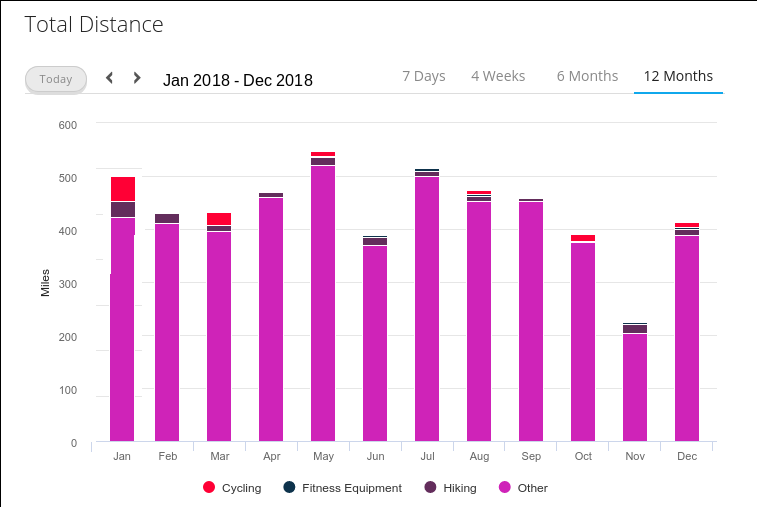 Compared to 2016, I actually skated fewer miles and cycled more. Many things changed but the standouts are jobs and weather. 2016 was a drought year. Early 2017 was very very wet. I did numerous workout rides, something I’ve hardly ever done since putting on skates in 1997 and I did it because it was persistently too wet to skate. I was mostly employed in 2017 vs mostly not in 2016. I biked rather than skated to work on days when I needed the extra carrying capacity. This will not extend much into 2018. I’m going to cut back on my self-powered commutes. I like to do it but the 21 mile round trip just takes too long and since I tend to work long hours it doesn’t leave much time for anything else. I aim to go from a nominal 3-4 skate commutes + 1 bike commute to a steady two skate commutes per week. I will probably only bike when it rains. Totals won’t hit 6000. Skate miles may struggle to reach 4000. And that is fine. The may be more productive and interesting miles. I’m already signed up Northshore, A2A, and Rollin’ on the River. I will probably repeat Saguaro Sunrise. I’m strongly considering Apostle Islands and may even do Battle of Bear Creak. I hate travelling for less than a marathon distance but the April date has a lot of appeal. Or who knows? Maybe 2018 will be completely different. How many sets of wheels you burn through? Should be a "Strava" category for that too. Last edited by Joey; January 8th, 2018 at 07:56 PM. Somewhere between one and two, closer to one. The XF's I changed out in July, went on the previous September. The XXF's I put on in July are still going strong. That's about 2200 miles. I prioritize durable (generally harder) wheels, rotate often and wear them long. I usually wear off at least 5mm before I bin wheels. Peculiarities in my stride and no t-stops mean my wheels flatten rather than becoming pointed or beveled. In better years, every-day wheels get binned when race wheels get demoted rather than when they are fully worn out. Wheels are seldom race-worthy after three competitions. But the last couple of years have been short on races so the wear period has stretched out. The shock band was plainly visible in my MPC Black Magic XFirm's at the end. How many wheels, and what sort, did you use up? I use Labeda Asphalt wheels, 85A. My skates use 80s up front and rear, 76 in the middle. I never rocker them for distance of course, and most of my freestyle slalom sessions are inside on a wood floor = zero wear. I get about 1000 good miles out of a set of wheels. Mine also wear down squarely, not pointy except at the very start of wear. I can push them to 1500 miles but crashing from losing an edge goes way up by then. Hey, at least I don't play hockey anymore. Could go through three sets of wheels in ONE DAY on asphalt! But I used to get factory blems with no labels for $1 each. Those were the days! My new quads will save me some $$$ on wheels. They last almost forever. Adding the quads and longboards to my rotation I only have to put new wheels on the blades about once a year. Around $60 US. Down from last year, as was expected. I deliberately cut my commute from 3-4 round trips per week to a more consistent two. Still 6063 down to 5245 isn't that much. I think the key is consistency. I was often able to switch days when weather or other complications interfered with the primary day. Thus, I did two round trips nearly every week. Average skating speed is down a bit. I think this is due to this being an A2A year. More of my miles came from longer and slower workouts. The loss of group skating workouts hurt there too. 1754 Total skating miles for 2019. Combination of skateboards, quads, and inline skates. (252 Hours). I'm still happy with 2018 all things considered. I did cycle a lot more due to crummy weather, but do not track those miles. Just my daily commute is 40 miles per week but I did commute on skates/boards more this year than ever before.